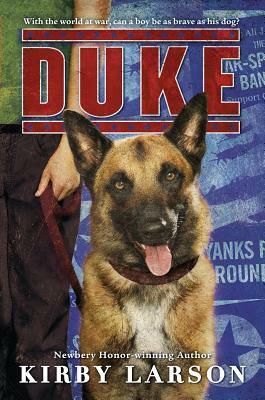 With World War II raging and his father fighting overseas in Europe, eleven-year-old Hobie Hanson is determined to do his part to help his family and his country, even if it means giving up his beloved German shepherd, Duke. Hoping to help end the war and bring his dad home faster, Hobie decides to donate Duke to Dogs for Defense, an organization that urges Americans to "loan" their pets to the military to act as sentries, mine sniffers, and patrol dogs. Hobie immediately regrets his decision and tries everything he can to get Duke back, even jeopardizing his friendship with the new boy at school. But when his father is taken prisoner by the Germans, Hobie realizes he must let Duke go and reach deep within himself to be brave. Will Hobie ever see Duke, or his father, again? With powerful storytelling and gripping emotion, critically acclaimed author Kirby Larson explores the many ways bravery and love help us to weather the most difficult times. "With World War II raging around the globe, Americans are called upon to sacrifice everything, even when it might break their hearts. When fifth-grader Hobie Hanson’s father leaves his fishing boat in Seattle to pilot a B-24 in Europe, he tells Hobie ?to step up and do what needs to be done.? Whether it is buying war bonds, collecting rubber or simply making due with less, Hobie is giving all he can to the war effort. But when he begins to feel the pressure to lend his beloved German shepherd, Duke, to the Army, Hobie realizes he still has more to give. Authentic details, such as radio drama, ration stamps and the ever-present worry of a telegram bearing terrible news, enrich this story of a boy and his dog. References to the Japanese internment and anti-German prejudice bring the war even closer to home. However, Hobie is no perfect hero. He wrestles with his decisions, making mistakes along the way; a refusal to glamorize war sets this story apart. The universal anguish Hobie feels in his sacrifice will touch readers struggling to make sense of their own losses.